Two women killed in massive traffic accident en route to Jerusalem from haredi city of Modiin Illit. The victims killed in a massive traffic accident outside of Jerusalem Sunday morning have been identified as residents of the haredi city of Modiin Illit in southwestern Samaria. Initial reports identified the two women as sisters. They were later identified as Rachel Chaya Guttman, 24, and Ruchama Rosen, 27. The accident occurred at approximately 9:15 a.m. Sunday morning on Route 443. 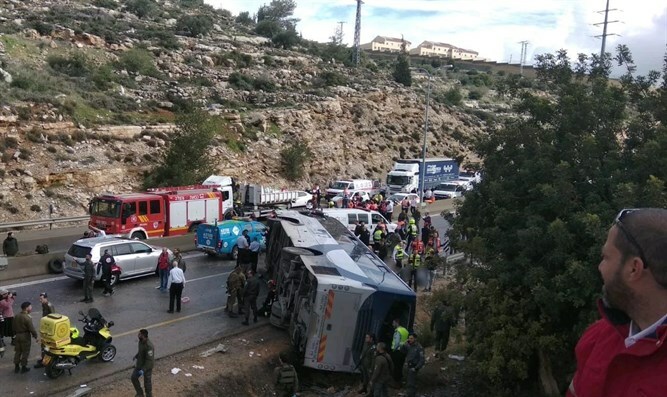 A bus from the Kavim company’s 304 line which links Modiin Illit to Jerusalem, was travelling down Route 443 from Modiin Illit towards the capital when the accident occurred, a spokesperson for Kavim said in a statement Sunday afternoon. In addition to the two women killed in the accident, 41 other victims were injured. Two of the injured are said to be in serious condition, with another five in moderate condition, and the remaining 34 victims in light condition. The victims were treated on the scene and at least 33 people were evacuated via ambulance to hospitals in Jerusalem, Tel Aviv, and Tzrifin. One victim was evacuated to Hadassah Ein Kerem, 14 to Shaare Zedek, 11 to Assaf Harofe (also known as Yitzhak Shamir Medical Center), six to Hadassah Mount Scopus, and one to Ichilov.